A thorough annual boiler service takes time to complete properly. If your Engineer does it quickly then he may not be doing it correctly. It takes time to carry out combustion analysis, gas tightness test, gas rate, gas input pressure and all the other things that should be done. The Engineer should be willing to explain what he (or she!) is doing and why. Please don't be ripped off! We have recently attended two boiler breakdown calls where the boilers had failed because the condensate trap had not been cleaned. In both cases this caused the combustion space to fill with water and fail. BOTH of these had recently been serviced!! We always check and clean the condensate traps as part of our servicing routine, if your Engineer does not do this, ask him (or her of course!) why not. If you have a service contract with a certain large British company and they recommend a new boiler/powerflush or tell you parts are no longer available for your boiler then please call us if in the Eastbourne area. This is rarely correct. In our view it is much better to repair the boiler properly than go to the huge expense of fitting a new condensing boiler that may save you £75 a year on the gas bill. Just does not make sense. After the horrific gas explosion in Clacton, please, please make sure that whoever services your boiler carries out a gas tightness test. Although this is not mandatory on a service, we think we have a duty of care to our customers to check for gas leaks. So if your service only took a few minutes this has probably not been done. We ALWAYS do this. Hannah and I were asked to look at a boiler after a certain large British company (that work on gas) had told the customer a new expansion vessel was required at a cost of over £400. In fact they said the boiler was very old and really should be replaced at huge cost. Hannah isolated and drained the boiler and found no air pressure in the expansion vessel. She recharged it and the boiler has been working fine ever since. I'm starting to get the impression that these guys must be on some sort of bonus for selling parts and boilers that are not really needed. 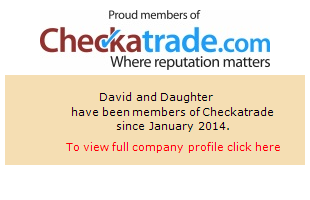 We have now become a member of 'Check a Trade'. The vetting process is quite strict, I would'nt want it to be any other way. Many thanks to all our customers who have taken the time to give us glowing feedback, it is very much apreciated. Nice to see they they need proof of qualifications, public liability insurance and personal details. Every customer will now receive a freepost feedback card, what a good idea. We have also been approved by East Sussex County Council Trading Standards.